St. Francis’s Church, Sandycroft. 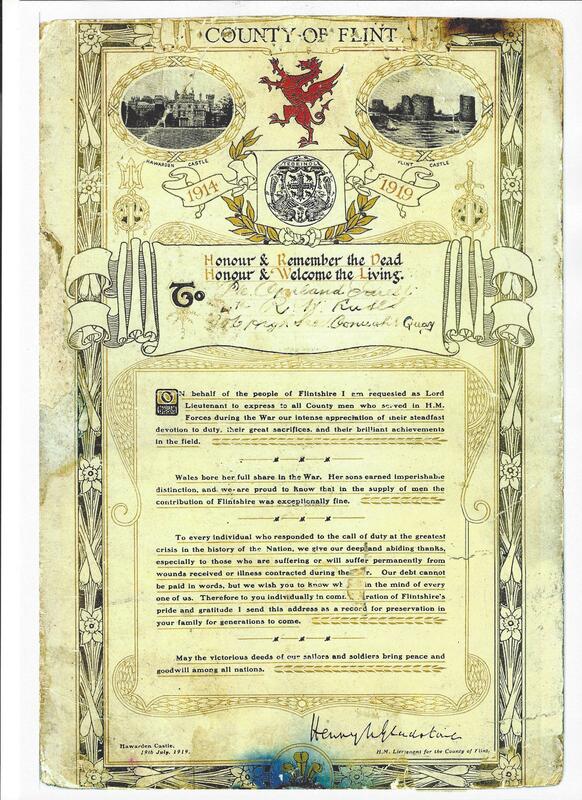 September 1915 – Excerpt from Hawarden Parish Magazine. “For three weeks past many people have been deeply anxious about their loved ones in the 5th Royal Welsh Fusiliers. They know, from the published list of casualties among officers of the Battalion, that they have been in action at the Dardanelles, but so far have not learnt anything of their fate. “No news,” we are told, “is good news,” and we know that the authorities do their best to inform relatives as early as possible, so every day that passes increases hope while not allaying anxiety. We must wait in quiet trust and prayerfulness to God for hope to be fulfilled. Lce-Corporal Ernest ELLIS of the 5th, so his mother has been informed, has been seriously ill, and we are asked to pray for his recovery. We trust that his mother may be given of God hope and comfort in her anxiety. Among the R.W.F. are a number of Pentre men who have also been in action, and Thomas REDFERN and Arthur HUGHES are reported as wounded, and Fred ASHBROOK as suffering from dysentery. We shall pray for their recovery. 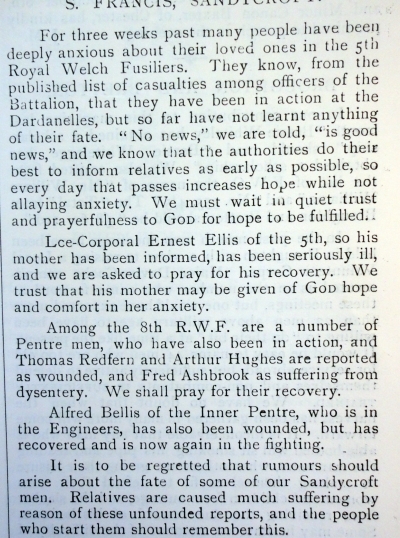 Alfred BELLIS of the Inner Pentre, who is in the Engineers, has also been wounded, but has recovered and is now again in the fighting. St. Francis’s Church, Sandycroft. October 1915 – Excerpt from Hawarden Parish Magazine. The period of anxiety for Sandycroft people regarding men in the fighting in the Dardanelles is now happily past; but we have unfortunately two fatal casualties to record, both being men closely related. Pte. Joseph SMITH and his cousin Pte. Stephen LATHAM, were killed soon after landing at Sulva Bay. Both belonged to Pentre and their homes are situated a few yards from each other in the Mechanics’ Lane. We feel deeply for their bereaved relatives, but at the same time we know that, like so many thousands more, they will comfort themselves in the knowledge that they died as true men and brave soldiers, and we believe that God will accept their sacrifice of themselves in as true a Crusade as ever was, as a memorial for their eternal salvation. Privates, Phil ROWELL, Ivor CATHERALL, Fred ASHBROOK, and Lance-Corporal Ernest ELLIS are all down with dysentery and to the joy of their friends are now in hospital in England, as also Arthur HUGHES and Thomas REDFERN, who have been wounded. All are recovering and, please God; we shall soon have them all with us again after their tremendous experience. Sergeant ELLIS, Ernest ELLIS’ father, and Lance-Corporal William NEAL are, we understand, the only remaining effectives left of their whole Company (B) of the 5th R.W.F. and we trust that their good fortune may continue. Alfred BELLIS has returned to hospital at the base, not having fully recovered from his wounds. Private ROWLANDS, of Pentre, and Pre. Frank KENWORTHY have not been heard of for some time, and we trust that no ill has happened to them. Pte. Tom HUGHES, Dry Bridge, has been home for the past fortnight, having now quite recovered from the wound he received in the Dardanelles fighting. DIED IN ACTION – Private T. WIGLEY, R.W.F., son of Mr & Mrs WIGLEY, Gladstone- terrace, Sandicroft (sic) is reported killed in action. He was before joining the army on the works staff of Messrs John Summers, Shotton. He was 22 years of age, and has another brother serving in Palestine.